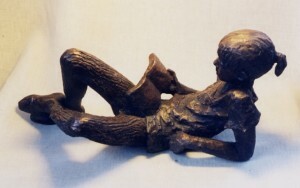 The sculptures that I make have developed from early carving in stone and then refractory brick, in which I carved negative shapes into which bronze was poured, to modelling in wax for small work or in clay for larger pieces, which are then cast in bronze or occasionally in cement or resin. from where I live. I have also made portraits and modelled birds, including owls, flamingos and hawks, cats, dogs, donkeys, goats and other animals when the opportunity has arisen, such as the 36 Terns for a water sculpture at Dudley. I enjoy working on a commission and hope that the work, which is generally figurative, will be self explanatory without the need for a title: I have come to realise that the sense of freedom and hope that I experienced as a teenager in Holland after five years of occupation in World War II has really never left me and that it still colours my work. Centenary sculpture,Three girls; bronze, St Saviour’s & St Olave’s School, SE1 2003. 1958,59 Martinus Lienur, The Hague; Rotterdamse Kunstkring, Rotterdam. 1964 Holland Park Gallery, London. 1975 Woodlands Art Gallery, Greenwich. 1985 Playhouse Gallery, Harlow (with Robert Koenig). 1986 Galerie Petit, Amsterdam and N.M.B. Bank, Amsterdam. 1987,91,93 Ashdown Gallery, Uckfield, Sussex. 1990 Blackheath Concert Hall, Blackheath. 1992 Gainsborough House, Sudbury, SufFolk. 1993 Royal Netherlands Embassy, London. 1998, 2002 Galerie Petit, Amsterdam. 1972 87 Royal Academy Summer Exhibition 14 pieces in 10 exhibitions. 1977 London Group; Playhouse Gallery, Harlow; The Mill Studios, Lewisham. 1979 Loft Gallery, Stanstead Abbots. 1979, 86 Work constantly on show at Ash Barn Gallery, Petersfield. 1981 Leinster Fine Arts, London. 1982 Sculpture in the Park, Cheltenham; Concert Hall,Lewisham; Hall Place, Bexley. 1983 Ten Artists from Space Studios, South London Gallery. 1983, 85 Whitechaple Open; Open Studios, Deptford; Sculpture Court, RIBA, London. 1983 88 Leicester Education Authority; 14 works purchased for schools collections. 1985 Norfolk House Artists, Woodlands Art Gallery, Greenwich; Ladywell, London. 1989 Wycombe Abbey School, High Wycombe; Knapp Gallery, Regents Park. 1990 Singer Museum, Laren, Holland. 1992 South London Gallery Centenary Exhibition. 1992,93 Royal Academy Summer Exhibition. 1993, 94 Sculpture in Riverdale Gardens and at Town Hall, Lewisham. Greenwich; Royal Academy Summer Exhibition; Collyer Bristow, London. 1997 Chancery Gallery, Royal Netherlands Embassy, London. 1998,99 Unicorn at Space 8, London; A&C Gallery, Greenwich. 2000 Greenwich artists at Rangers House, Blackheath; Galerie Petit, Amsterdam. 2001,02 Unicorn Gallery, London; Broomhill Sculpture Park, Devon.